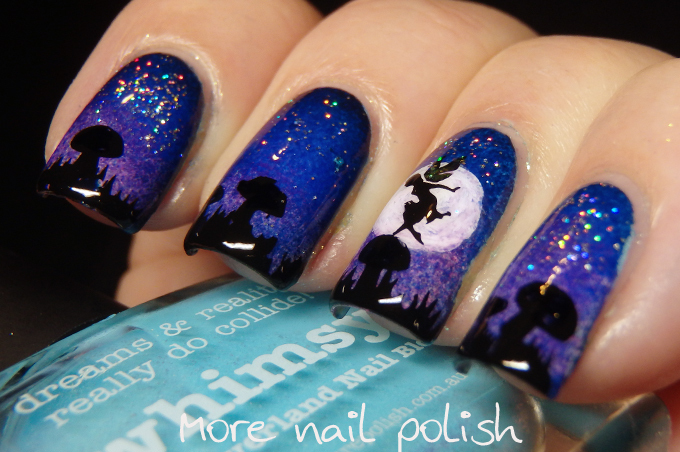 One thing I certainly found when googling for whimsical pictures was that fairy's are definitely whimsical. 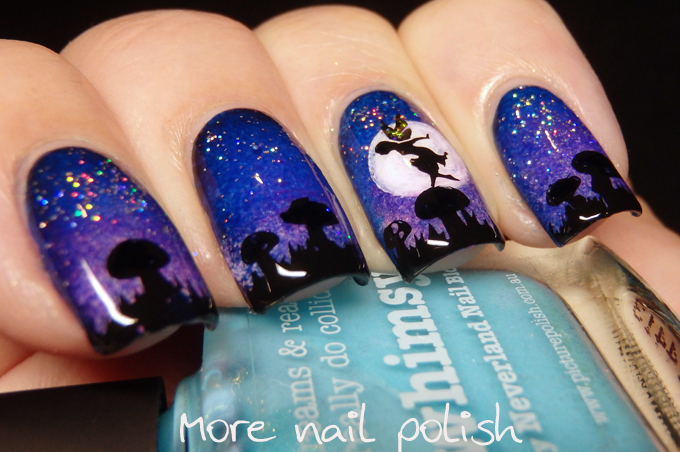 I searched though all my nail plates to find a fairy image, but would you believe that I found the perfect image on a new plate that I just got in the mail the day I painted these nails. The plate was DRK XL Magic Garden. I haven't even had a chance to really look at the plate properly yet, that that fairy was perfect. The mushrooms and grass were stamped from EDM07 plate. The moon was painted free hand. 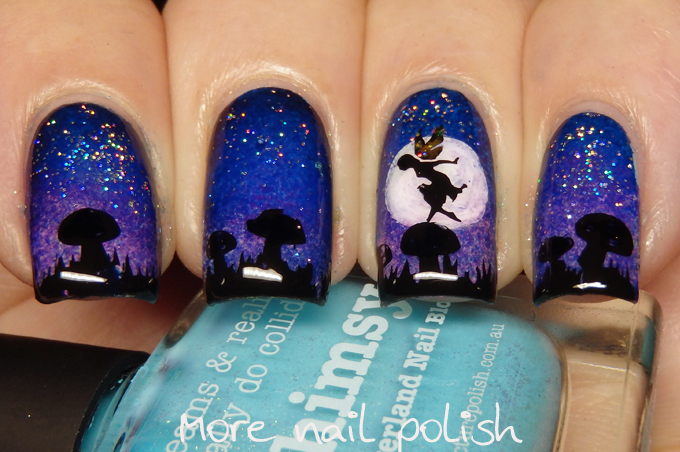 Now would you believe that the base polish I actually started with as Picture Polish Whimsy? 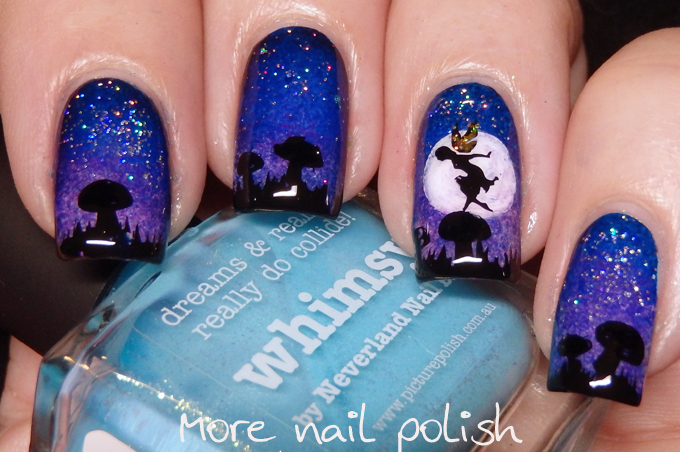 I just had to use a polish called Whimsy for the whimsy theme. But after I sponged on the darker jelly colours in blues and purples from the Dance Legend Enamel Glass collection, there was pretty much no trace of whimsy left. Oh well, at least I knew it was at the heart of this mani. As a last final touch I added some iridescent flakes to the fairy's wings and added some holo glitter as sparkly stars in the sky. These are beautiful. That holo glitter is the perfect finishing touch! The base that you created for this look is absolutely stunning! The added sparkle was a great touch!